Octopus Carnival | A repository of my English language RPG-related writings. Mostly GURPS with a smattering of other systems. We have bears in the real world, so they don’t require much in the way of introduction. 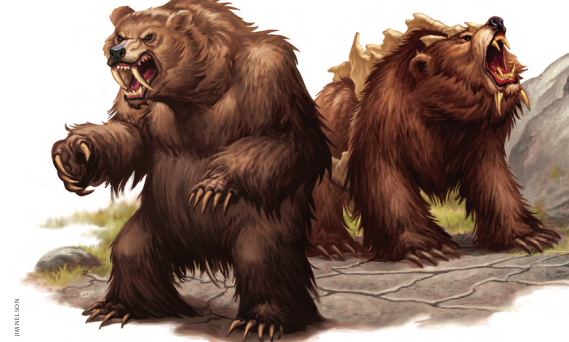 D&D has always included a variety of bears in its bestiaries, their various real-world species lending themselves well to the “pallette swap” approach preferred by its older editions. After going through a few Monster Manual-only entries, we finally arrive at one that exists in both books. The Monster Vault has an appendix with stats for mundane animals, likely a response to complaints from traditionalist players that the original Monster Manuals didn’t include any. But wait! If the Monster Manual doesn’t have anything on mundane animals, what does it say about bears? Let’s find out. They’re bears. Large, omnivorous, inhabit temperate or colder areas. I wasn’t aware of it until recently, but it appears the “Bear Lore” entry in the Monster Manual is kind of a running joke among 4e players. It’s structured just like the lore entries for weirder monsters, so it ends up telling us a PC needs to succeed at a DC 20 Nature check to know that bears attack with their claws. IIRC, while real-life bears can be dangerous, they usually don’t go out of their way to attack humans, so most bear encounters will be peaceful. Of course, this being D&D, you can encounter some bears that don’t exist in real life and that are far more ornery. Combining the two books gives us three different bears: a mundane Bear (MV), a Cave Bear (MM), and the ever spiky Dire Bear (both). All are Unaligned natural beasts and have Int 2. The Bear likely represents a brown bear. It’s Large, and a Level 5 Brute with 80 HP. It attacks with its claws, and can use a Bear Grab about twice per fight (it recharges when the bear is bloodied). This allows it to make two claw attacks against the same target, and if either one hits the target drops prone and the bear grabs it if it has fewer than two creatures grabbed. This ain’t no normal bear hug. At the start of the bear’s turn, it deals automatic damage against any creatures it has grabbed. The Cave Bear is meant to represent a species that’s extinct in our world. It’s a Level 6 Elite Brute with 170 HP, but for some reason it’s only Medium. It’s more of a striker than a grappler: aside from its claws, it has a Cave Bear Frenzy that does claw damage in a Close Burst 1 and recharges on a 5-6. That’s a bit less multi-strike ability than I’d expect from an elite monster, but not too much less. 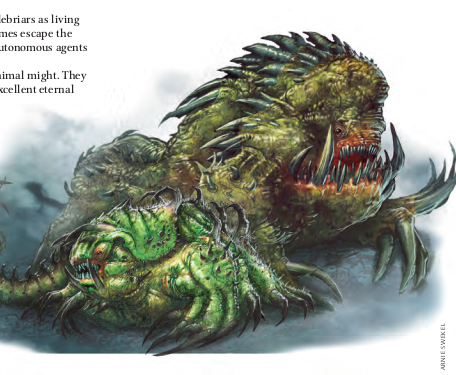 The Dire Bear follows the “bigger and spikier” theme set for dire animals in Third Edition. The Monster Vault version is merely an update of the Monster Manual, so I recommend using that one in all cases. It’s a Large Natural Beast and a Level 11 Elite Brute. Its basic attack are its claws, but it will rarely use that. The Dire Bear’s real go-to ability is Maul, which is at-will and allows it to make two claw attacks. If both hit the same target, the bear grabs the target if it has fewer than two creatures grabbed. This grab requires a secondary attack in the MM version, but not in the MV one. The bear can also use a standard action to deal lots of automatic damage to a grabbed creature (that’s where you use its action point). Suggested encounters in the MM are: Level 6, two cave bears and one bugbear strangler (“us bears gotta stick together!”); and level 11, 1 dire bear, 1 ettin spirit-talker, and 3 ogre minions. Well, they’re bears. While there’s nothing terribly exciting about them lore-wise, they do their job mechanically (particularly the Monster Vault variants). One thing that might be fun is to have an evil druid as a villain, using charmed bears to do his bidding. Have the party be on the receiving end of the Aggressively Hegemonizing Ursine Swarm for once. Today’s monster is the Battlebriar, a plant creature that’s entirely new to me. It exists only on the Monster Manual. Being plants, these living engines of destruction are surprisingly low-maintenance. As long as a battlebriar has access to water, fertile soil and sunlight, it can live forever. This makes them good guardians in addition to being siege weapons. Fey creatures like to use them to guard their strongholds. Other battlebriar users include Hill Giants, which I found quite interesting. Sometimes they also escape their masters and go live in the wild. Battlebriars are Unaligned and have Int 3, so PCs are most likely to fight them when going against their masters. A wild battlebriar will likely leave the PCs alone if they don’t provoke it, though of course they might have no alternative if it’s blocking their goal. We’re given two stat blocks for these things. The Warthorn Battlebriar is a Large natural animate (plant), and a Level 14 Controller with 141 HP and a ground speed of 6. It has an aura of Grasping Thorns, with a 2-square radius, that makes its area difficult terrain for enemies and deals 5 damage to any that start their turns there. This thing has dozens of branches constantly flailing around! Aside from a reach 2 claw as a basic attack, it can also fire thorns from those branches in a close burst 2. This targets Reflex, dealing damage an slowing targets for a turn. Furthermore, its claw attacks pull victims towards the monster. Getting away from this thing is quite hard: you’re slowed, in difficult terrain, and when you manage to get away it pulls you back. It also has threatening Reach, and so can make opportunity out to its full reach of 2 squares. Its big brother is the Earthrager Battlebriar, a Huge elemental animate (plant). It’s a Level 28 Elite Brute with 634 HP, a ground speed of 8 and a burrow speed of 6. It’s made out of vines rather than thorny brambles, so its 3-square aura pulls enemies towards it. It’s the Reach 3 claws that do the slowing. It also has threatening reach, and it can trample - that last bit is how it attacks several characters at once. It resembles the Tarrasque in its tactics when on the offensive. When used as a guardian, it burrows and uses tremorsense to detect intruders, erupting below them to fight. The suggested encounter is level 14, a Warthorn being used as a weapon by a party of 2 cyclopes and 3 hill giants. Living siege engines are always cool, and these are nicely thematic for fey or elemental Earth-themed opposition. I liked them. Like every other MM monster, they need the damage fix, but other than that I see no fault with them. I like that their abilities match their in-world roles. The warthorn is your infantry killer, and the Earthrager with its burrowing and trampling ability makes short work of castles and walls. The Earthrager is the sort of weapon a mortal or fey army would round up to fight the Tarrasque… or, since it’s elemental, it might itself be a prototype or herald for the Big T.
Bats are tiny nocturnal mammals who feed on fruit and insects… but those aren’t the bats we’re talking about here. These bats are proper monsters. We get two different bat species here. Both are Medium, meaning they’re the size of an adult human and have enough wingspan to get that bulk airborne. 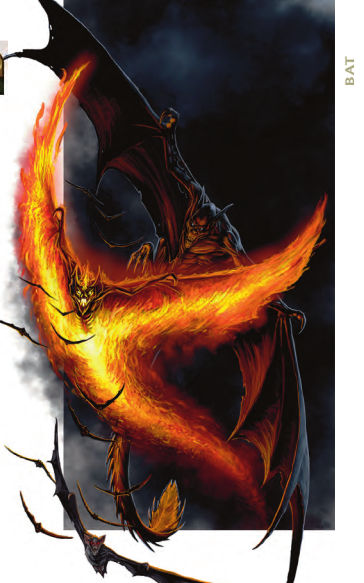 Fire bats are Elemental Beasts (fire), which are native to the Elemental Chaos but spread to the world through natural passages between the two planes and took root here. In much the same way cats migrated to Australia on ships and became a danger to the ecosystem, I guess. Shadowunter bats are apparently native to the world. They’re descended from normal bats who happened to live in places where necromantic energies from the Shadowfell leaked through, and those energies mutated them. Both types of monstrous bat have Int 2 and are Unaligned. They take well to domestication, and so might be found as pets and guard animals for people or intelligent monsters, particularly those that share origins with them. In fact, the Fire Bat lore entry specifically mentions azer, which gives credence to my theory that the azer used to be Heroic-tier opponents who got upgraded to Paragon at the last minute. Organizing monsters alphabetically by name means Bats are actually the first real Heroic-tier creatures we’ve run across in the book. Angels had an Heroic-tier variant but it was kind of a footnote among a bunch of more powerful individuals. Shadowunter Bats are Level 3 Lurkers that have 38 HP and fight as skirmishers. They’re quite clumsy on the ground, but fly with speed 8. It appears they attack with a wickedly barbed tail, which has a bonus to attack and does extra damage in dim light or darkness. They can use it in a Flyby Attack, moving their speed and making a tail attack at any point (and not provoking opportunity attacks when moving away). Hm… if one or more of these attack the party, I’d expect them to do so in an area that’s entirely shrouded in dim light or darkness. You’d think that this would allow them to get the bonus damage all the time, but PCs are likely to be carrying their own bright light sources in these places. So they’re going after the rogue who’s scouting ahead without a light source. If domesticated, their owners should probably employ some trick to neutralize the party’s lights. Fire Bats are Level 3 Skirmishers with 60 HP and 10 fire resistance. They fly as fast as shadowunters, and are as clumsy on the ground. Being bats that are on fire, their attack is a touch that does fire damage and ongoing fire damage. Their version of the flyby attack allows them to shift 4 squares and make an attack against anyone they touch on the way. The sample encounter is level 3, a party of goblins and their two shadowhunter bat pets. Functional opposition for when your party ventures into bat country. I think the fire bats work a little better, since the shadowunter’s bonus damage is too fiddly. Changing it so that they only need to start their turn in dim light or darkness to get the bonus would make them work better. Since they’re only level 3 regulars, the math bug doesn’t affect them all that much.